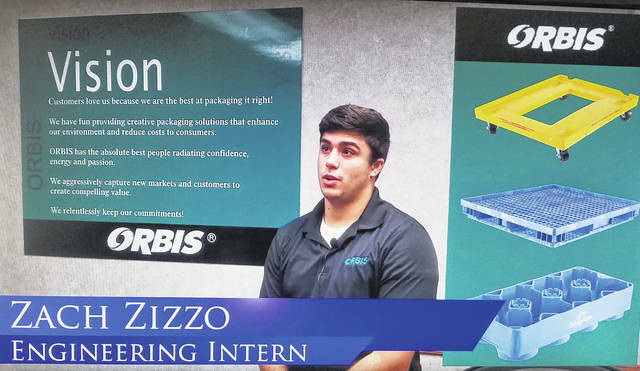 Zach Zizzo, a mechanical engineering intern at Oribis Corporation in Urbana, talks about his experience in a video produced by Ashley Cook, business liaison of the Champaign Economic Partnership. The Champaign Economic Partnership’s new business liaison, Ashley Cook, is providing students and others in the community an inside look at local manufacturing facilities and the career opportunities they offer. She’s begun a series of videos that feature interviews with interns and employees and quick tours of the companies. Cook is instructor of Ohio Hi-Point Career Center’s supply chain management program at Urbana High School. And she serves part time as business liaison, a position created by the CEP and Ohio Hi-Point with the help of financial supporters – the Champaign County Human Resources Manufacturers Council, DP&L, Clark State Community College and FASTLANE. – Zach Zizzo, who is working at Orbis as a mechanical engineering intern while the company pays for his education at Clark State Community College. Zizzo graduated from Triad High School, where he was enrolled in the Advanced Manufacturing program offered by Ohio Hi-Point Career Center. At Orbis he is involved in continuous improvement and designs hot stamps for plastic totes the company makes. The Orbis video can be viewed on the CEP’s YouTube channel (https://youtu.be/jijbyvw7cBM), as well as a video of The Hall Company (https://youtu.be/_KW0pJgdWQ0). Videos featuring Rittal and Weidmann Electrical Technology are in production, and Cook will be creating more videos. The videos also are being used by the companies and will be shown on 11 TV monitors that the CEP and its partners have placed in local schools and businesses.